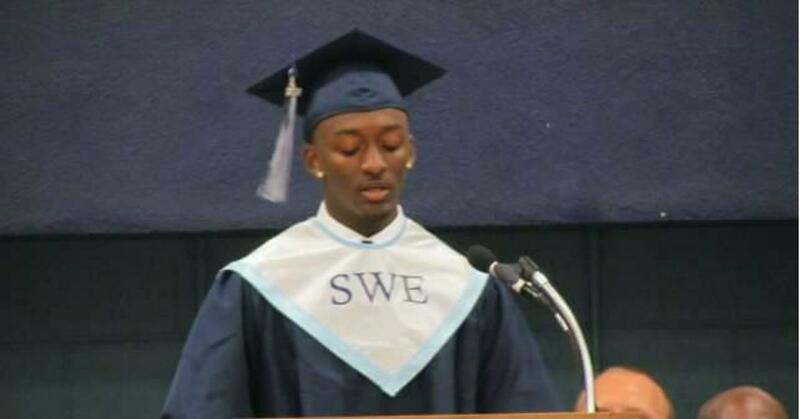 When High School Senior Marvin Wright took the stage at his North Carolina graduation to deliver a speech, he opted not to deliver the speech that Southwest Edgecombe's administrators handed to him. Instead, he delivered a speech he wrote himself, and the decision ended up costing him his diploma. Wright was encouraged by his classmates and teachers to deliver the speech that he wrote instead. "I looked at my classmates and most of them were nodding their head, like ‘Go ahead, Marvin, read your speech,'" Time reported. As Senior Class President, Wright expected to prepare a speech to be delivered on graduation day. He was reportedly told the morning of the graduation that he would not be delivering his own speech, but instead would read some prepared remarks that were handed to him by Edgecombe's principal, Craig Harris. Harris had informed Wright's mother, Jokita, that her son had missed the deadline for the speech and was never instructed to write one in the first place, which Wright denies. "When he got on the stage, I didn’t know which speech he was going to read because he did text me and ask me what should he do. He was kind of confused because he didn’t want to be embarrassed. I just said, 'Baby, follow your heart,'" Jokita said. Wright was told after the ceremony that he would receive his diploma from Harris. However, when he went to the Principal's office after the festivities were over, the door was locked and he ended up going home without his diploma. Edgecombe County Public Schools Superintendent, John Farrelly, was shocked by the treatment Wright allegedly received from the school. "It was absolutely an overreaction by the administration and totally uncalled for...I thought the speech was fine. It was appropriate. I found nothing wrong with the content of the speech. The administration gave the order, which never should’ve happened, to pull his diploma. I believe the administration did so because they were upset he didn’t follow the protocol." Time was able to get their hands on both the comments prepared by the school and Wright's original speech. Here's the one that the school's principal handed to Wright. And here's Wright's full speech. Good evening to all who are gathered on today for the commencement of Southwest High School’s 2017 graduating class. My name is Marvin Wright and I am delighted to be standing here as your senior class president. First and foremost, I want to thank God for making all of this possible. Secondly, I would like to thank all of the parents and family members for the unconditional love you have provided my classmates and I during our unpredictable phases of life, for ultimately sticking with us through thick and thin, and giving us constant guidance. I would like to also thank the faculty and staff of Southwest for instilling knowledge and preparing us for the next chapter that we will soon embark on. And lastly, but certainly not least, I would like to personally thank my mother, Jokita Wright, for all of the sacrifices you have made for my two siblings and I. Selfless, strong, determined, humorous, provider, protector are only a few attributes that exhibit who you are, which motivates me day to day. So, Thank you Mom! For without you I would not be standing here today. Now, class of 2017.... this it it! We have finally made it. There are no other people I’d rather have spent my high school years with than all of you. Most of the students in our graduating class have known each other since elementary school, which is an accumulation of 13 consecutive years. When we take a walk down memory lane we can all visualize ourselves being young, naïve, tiny elementary school kids who relied on nap time throughout Kindergarten, who look forward to recess every day, and counted down the days and minutes until the biggest event of elementary school…field day. Then we moved onto middle school where things didn’t work in our favor, such as me not hitting my intended growth spurt. Middle school was a transition period of having your own locker, having multiple teachers, dress codes were challenged in trying to figure out how to come up with your own “style” by also following the uniform guidelines, and athletics became an outlet for students who sought competition. Finally, we made it to high school. There was more freedom, better lunch choices, and opportunities for us to explore, to figure out who we are. It seems like yesterday we were timid freshmen excited to be part of the mature crowd, but unsure where we would fit in. For many of us, our first year in high school was a time where the temptation to look at your cell phone was unbearable and sometimes we caved in, which resulted in us getting our phones taken. Or how about when we attended our first Friday Night Lights football game in which we were able to stay out late and hang with our friends. Sophomore year then quickly approached us where we knew the routine and thought we knew it all, but in reality we were still being overlooked because we were still considered under classmen. Junior year, reality sunk in. We did all that we could to build up our resume by being committed to our academics, participating in varsity sports, and taking leadership positions in different clubs. We also took the necessary steps to prepare ourselves for the SAT and ACT, as well as faced the immense task of figuring out a timeline that will prepare us for after high school. I think it is safe to say that although junior year was the most stressful and challenging, it was the most rewarding. Once the class of 2016 walked across the stage we were finally seniors! The year we had been dreaming of since freshmen year, was finally here. There was so many things to look forward to: seniority, senior prom, senior picnic, receiving our caps and gowns, and the list goes on. As seniors everything seemed different…teachers became mentors, friends became family, and Southwest High School became home. Little did we know that this year would come at a blink of an eye and the past four years would boil down to this day where all the hard work, laughs, tears, and long hours will have paid off. Even though today is an accomplishment for the entire 2017 class and all of those who have helped us on this journey, it is going to take a lot of adjusting to get use to not seeing every single one of you on a daily basis. Even though I can't predict the future I know that we all have the ability to make a difference in this world. For you should have the mindset that not only will you graduate today, but everyday is a graduation. This ultimately means that graduation is a continuous process in which you should strive to true lifelong learning of continuous, self-motivated pursuit of knowledge for personal improvement. I am no expert in this journey we call life but we all have the ability to make a difference and to be that change the world needs. The past 13 years have equipped us for a time as this to stand bold in who we are. So I say to my classmates, cherish these last few minutes we spend here and the memories we have created and get ready for the journey ahead.Thank you guys for making my senior year better than I could ever imagine and for all the moments I will always hold dear to my heart. Thank you, and congratulations to the class of 2017!! !